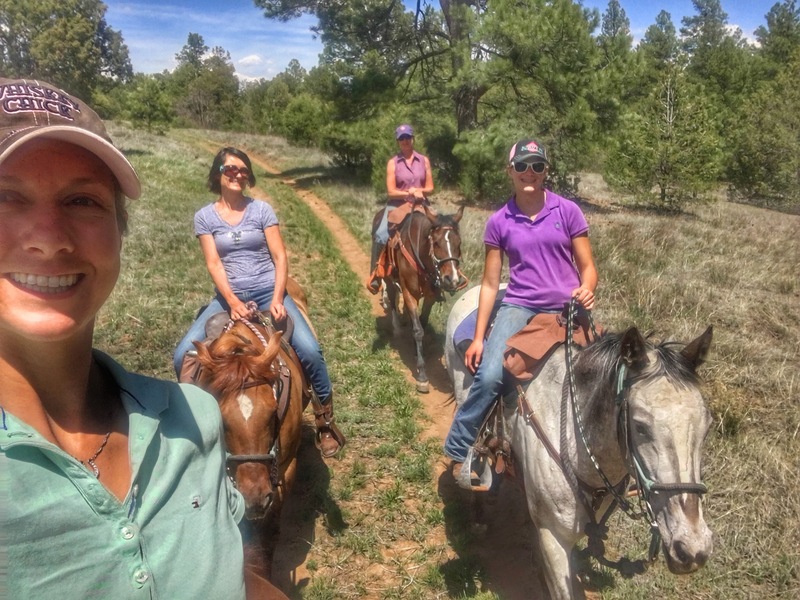 Never Holler Whoa In A Tight Spot – Navigating uncharted trails: Employing rescue horses in a horseback riding vacation business. On Sunday Toby and I braved the unseasonable wind and ventured out into the unknown on our first off property trail ride. We followed Mel and Jake down the neighborhood lane where trash cans lurked around corners and large rocks stood as sentinels. The little paint looked at each new object with cautious curiosity but never spooked. As we wound through the wooded path he eagerly stepped out, I think enjoying his new vocation. He flit from one side of the trail to the other trying to take in all the new sites, smells and sounds. It was like trying to ride a butterfly in the breeze. He carefully picked his way through the rocks but when it came to move around the long limbs of a cholla my leg cues became ineffective. I ended up dismounting and leading him around the cactus, there was no need to make this pleasant afternoon a disaster. When we made the turn back for home Jake began to jig and bounce. We stopped and Mel worked him through one of his nervous moments, Toby waited patiently like a seasoned trail pony. Our decent down the hill proved to be my mounts biggest nemesis. Although he willingly accepts a rider, he’s still learning how to carry their weight. As my center of balance moved over his shoulders he naturally turned across the hill to traverse. I instead pointed him back down the slope and offered him steady support as he learned to bring his haunches under his body. We retuned back to the barn with a sweaty saddle pad and an itchy backed horse. This big outing had left Toby tired and me with a list of arena work, legs cues there at the top. It’s back to schooling for us but Toby and I sure did enjoy our first field trip. Not every training ride goes as planned. Toby and I have graduated from the arena to riding around the property. We were following Mel and Jake over logs, around trees, and Toby was handling every obstacle like a champ. I became over confident and thought it was a great idea to video our awesome training ride. As the horse in front disappeared around a corner Toby became nervous and wanted to catch up. I was busy playing videographer instead of trainer. When I added my leg to aid Toby around the large cactus bush, he didn’t pick up on the cue and aimed strait for the cholla. 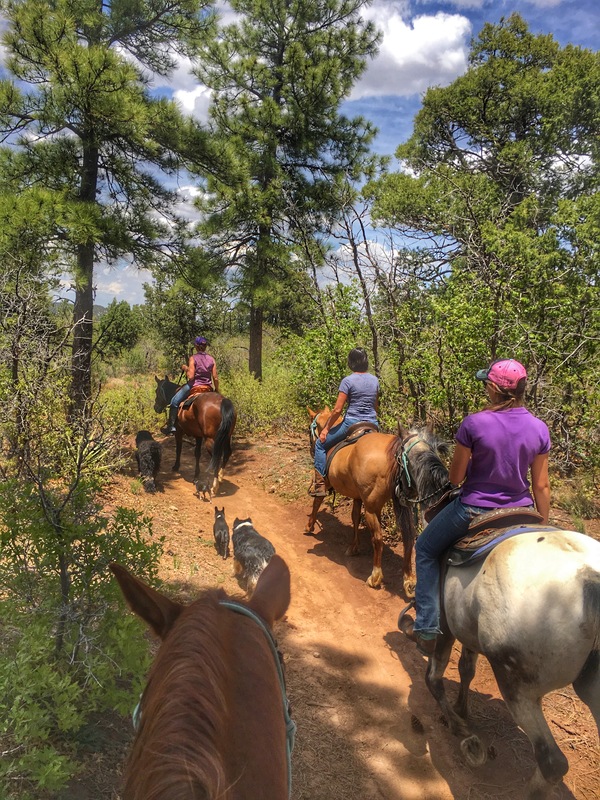 I’m pleased to report that both horse and rider avoided the prickly, instead I escaped with only a mouth full of pine needles from a near by piñon tree. When I’m asking a horse to learn they deserve my full attention. Although it was Toby’s training, I’ve definitely learned my lesson. The red waters of New Mexico run through the salted desert like veins through an open hand. This photo was taken in the river bed of Ojito Open Space, where petrified trees and the bones of the largest dinosaur, the Seismosaurus, have been discovered. Two Ears Tuesdays are back! Follow our journeys through New Mexico here each Tuesday. Come stay with us and discover these places for your self. It seems when life gets busy the first thing I set upon the shelf is this blog. Lately it’s been shoved to the very back corner where only dust and spider webs live. In the months it’s sat idle an entire summer has slipped by. The balmy days between May and September are undeniably the busiest for the business. With only 5 seasons under our belt, Enchantment Equitreks is in its infancy and I’m trying to learn how to juggle and balance all the hats I now wear. Somewhere amidst the chaos I decided to write a blog. I was keeping up pretty well with a weekly post and a few longer pieces sprinkled through out the month. Yet it seemed as the days got longer I found less time to write. A few days ago, as I was mucking paddocks, I listened to a pod cast about You Are Enough. Even though it was an interview with Deborah Burkman about her 17 year yoga teaching career, I found it spoke directly to my multifaceted life that reads like a drop down menu. I may be missing a few categories, but when something needs to be fixed, fed, or facebooked, I’m your go to gal. However, I find my self bogged down with trying to get it all done. During her interview, Burkman said, “Find your purpose and come back to that. And know that you are enough.” This simple and clear message lifted the self imposed weight off of my shoulders and folded it into a more manageable carrying case. What I do every day is enough. No matter if my day is filled with time in the saddle, time on the computer, or even time reading a good book, it is enough. My to-do list will always be there. The emails will keep coming in. Horses will need to be fed in the morning. Part of accepting this truth is focusing your path and knowing your purpose. I had to start with the big questions. What is the purpose of my business? Then work down to the smaller details. What is my purpose for this blog? I love writing because it gives me the creative outlet needed to keep my brain lubricated. I’m ok not making money, becoming famous, or having heaps of followers. So when my brain shuts down for a while, and my blog sits in the recess of a dark shelf for months, I’ll know it’s ok. My purpose guides my path and what I do is enough. I intended this post for a Two Ears Tuesday, but it took too long to write. Honestly I had to think a lot about this subject. Last week Paige, our 14 year old neighbor who works for us as an outrider, lost her mare. Belle was Paige’s first horse, the first two ears that would listen to her heart, the first soft muzzle to nuzzle her soul, her first show ring partner, her first life teacher. It’s hard to write about the loss of an equine best friend, so many of us have been on the broken hearted side of this story. Instead I want to write about the unshakable bond between mother and daughter. In the last few days of Belle’s struggle, Paige and her parents Mike and Tam worked around the clock to keep the little Arab mare comfortable as possible. When she would call us for help, I could hear the heartbreak in Tam’s voice, not only for the exhausted horse but for her daughter. Mothers want to protect their babies from the sharp pain of life, from the hurts of the world. All Tam could do was best prepare her girl for the heartache that would follow and be there with a hug that only moms can give. Paige is a very strong and resilient young lady, but I could see the loss in her eyes and the pain in Tam’s heart. Only a horse can sooth this kind of fracture, so my mom suggested we take them riding. Belle passed away late Saturday night and Sunday afternoon we loaded up our soul weary friends and a few of our horses. My mom, Paige, and I all fell into the familiar routine of saddling hoses, strapping on saddle bags, grabbing snacks and water, all the preparation we would do for any client, but today’s client was Tam. It was the first time she had ridden with us as Enhantment Equitreks and her daughter as an outrider. There was light conversation at first, but as the ride took us through forest, meadow, and ridges we all became quiet. 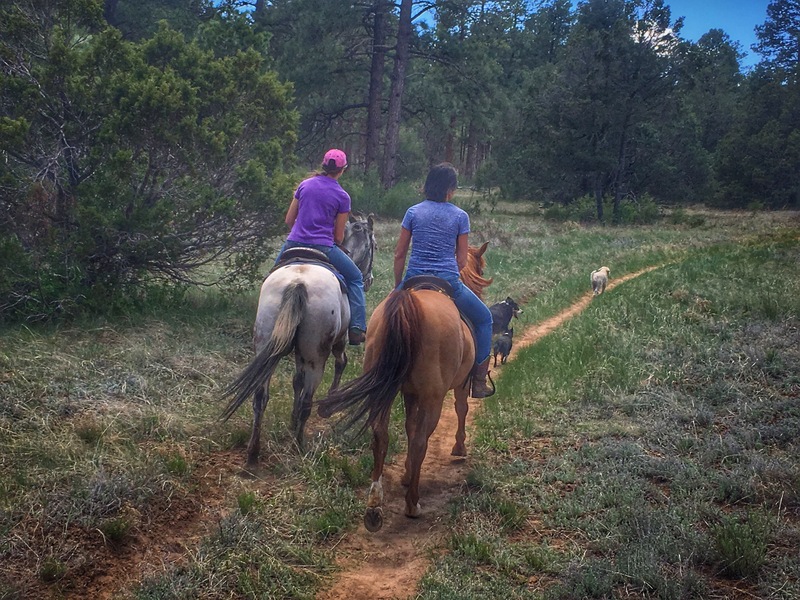 As Tam watched her daughter expertly guide us down the trail, I saw pride replace the pain in her heart. You could see how proud she was of her strong, confident daughter. Moms never realize that we gain our strength from them. “It’s ok mom, it’s a part of life,” she answered. It was then that I watched Paige’s heart mend. 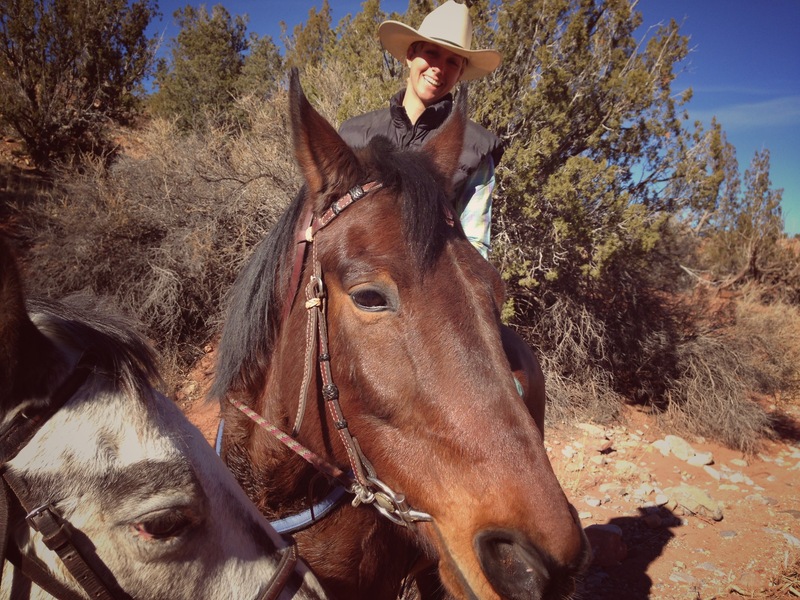 She knew that her mom supported her passion for horses, but now she knew they could share it. I hated that our first mother daughter ride was in the wake of such a loss, but out of the anguish came solace. The Sunday before Mother’s Day is now officially the annual Mother and Daughter’s Princes Belle Memorial Ride. I look forward to next year when we celebrate the resolute maternal bond and the remember the spunky sorrel mare. This Mother’s Day I will make sure and wrap my arms around my mother because moms need little girl hugs as much we need mommy hugs. I am in the middle of a deep love affair with New Mexico. It began with the cotton wood trees that lined the lane of my childhood home, it intensified with the snow dressed mountains ripe for a ski bum teenager, and solidified by the banks of the bosque where thoughts can meander in the middle of a city. Even now in my seemingly grown up world, a desert sunset sends me into a moment of childlike awe. When I came across this between the ears photo of the Rio Grande wandering through the Garrapata Ridge, I knew I wasn’t alone in my love for the Land of Enchantment. Pam McArthur, the owner of McAurther Quarter Horse Boarding Stables, captured one of these moments of awe. Scrolling through her Facebook page revealed her own New Mexico romance that incompasses Aspen groves, mountain lakes, and a sage brushed desert. 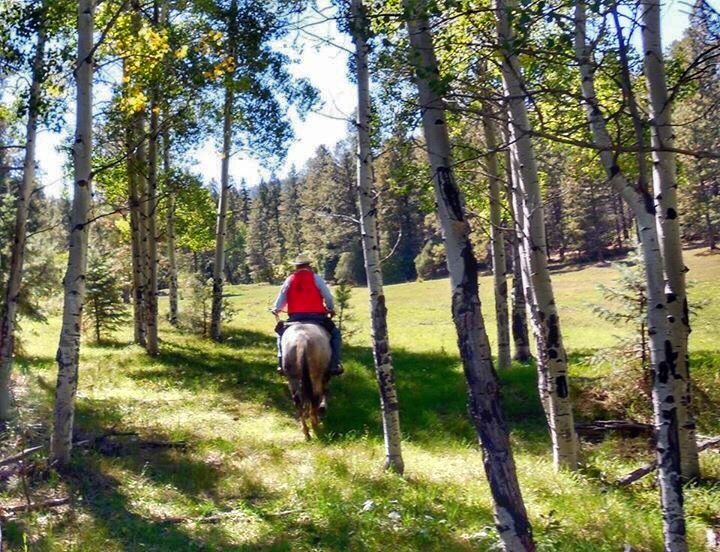 Although she is located in the northern part of the state, near Taos, Pam has an abundance of diverse landscapes to ride through. 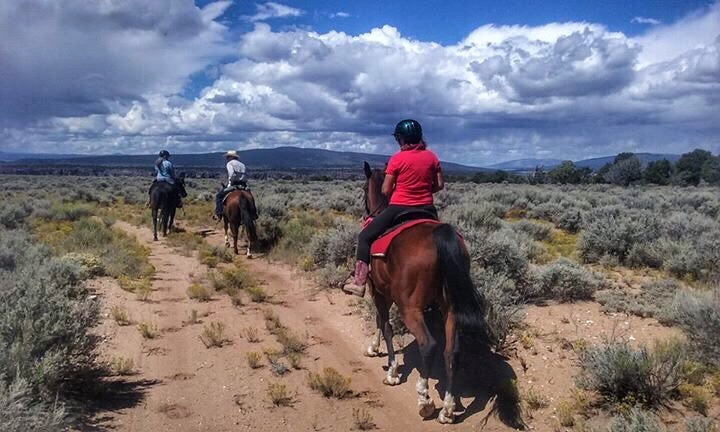 It is New Mexico’s wealth of varied terrain that I want to share with other equestrians. I’ve been asked many times why I started my business here instead of Colorado. It’s simple… I never ride in the same area twice. Although we ride the same trails with clients week after week, the land evolves, dilevering a new perspective each time. The sandy arroyos sparkle in early morning sunlight, mountain flowers emerge in pinks and purples maturing into reds and oranges, river banks overflow growing into salt cedar jungles. New Mexico is an inigma to most visitors who invision our state covered in saguaro cactus and cow sculls. Yes we do have cactus but we live in the high desert that spans from grasslands to alpine forest. The plethora of open space gives the internal nomad a place to ramble. The afternoon thunderstorms that roll across the horizon, the sunset casting a pink hue on the Sandias, and the crisp blue skies that never end, all speak to the soul. For those who call this magical place home, wether by birth right or by migration, we love where we live. 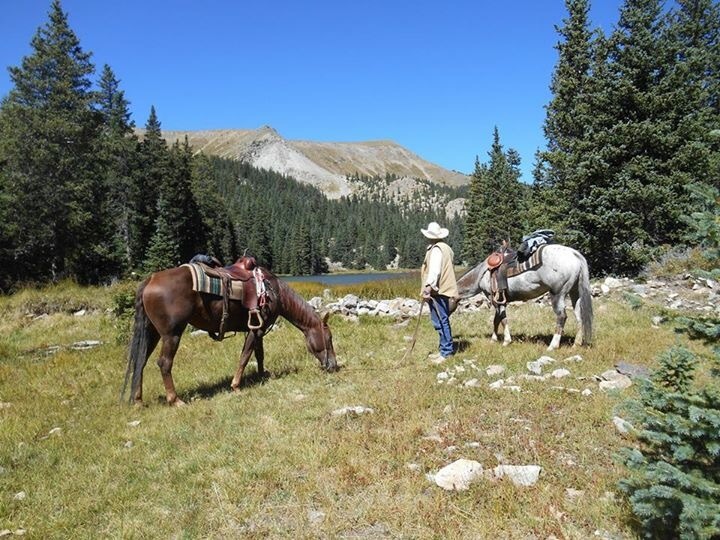 To explore the wonder of the Land of Enchantment by horseback please visit Enchantment Equitreks to book your riding vacation. All photos curtesy of Pam McAuthur and McArthur Quarter Horse Boarding Stables located in Rancho de Taos, NM. This is a bit of a reverse Two Ears photo that captures the joy of riding an OTTB. Cash has been my first rescue, my partner in crime, my wings, my sanity, my most frustrating moments, my best friend. All horses make me smile but only this boy makes me grin.